All Landlords hate having vacant property, especially if its for a prolonged period of time. Sometimes owners feel a need to fill a vacancy right away. Whether its because of financial hardship or an important business trip, they should avoid putting the first person that shows interest. Its important to know what the consequences are to renting to unqualified tenants. This is the biggest risk that a landlord takes on when leasing a property out to an unqualified tenant. 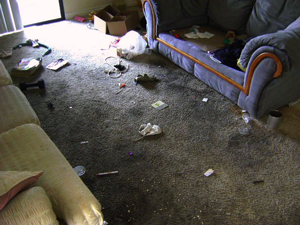 It only takes a few days for a tenant to wreak havoc to a property which can result in thousands of dollars in damage. The biggest identifier of a tenant who will likely damage a property is past judgments and poor rental history. If you see these red flags, think twice before selecting this tenant. Landlords expect that rent is paid on time and on a regular basis. Tenants with poor rental history or credit can be a sign that they are more likely to pay their rent late. In some cases, investors prefer this because they receive additional income from late fees, but this can cause the tenant to struggle even more because they now have to come up with that much more money each month which could eventually result in them not being able to come up with all the money leading to an eviction. Coinciding with timely rent payments, many unqualified tenants will often times request an extension to pay their rent. Whether its because they don’t get paid until Friday, their great uncle twice removed needed some extra money to pay their power bill, or the tenants car broke down, there will always be a reason that they cannot pay rent on time. This is not only irritating, but also time consuming because now you have to spend extra time following up with them and the landlord until rent is either paid or the tenant is evicted. An unqualified tenant can be very costly. While there are some circumstances that do justify taking on the added risk, its important to consider the ramifications and be prepared if things don’t work out. Aloha and thank you for contacting us. We will be in touch with your shortly. We look forward to helping you invest in a great tomorrow.